The Big Dig is all about getting people involved in their local community garden. Hull Food Partnership will be supporting 3 new or under-developed growing sites in the city to help them get their veg growing seasons started in 2019. If you would like to get involved, please contact us using the form below. Volunteer for a day of good work and good food to help local gardens get ready for the growing season. 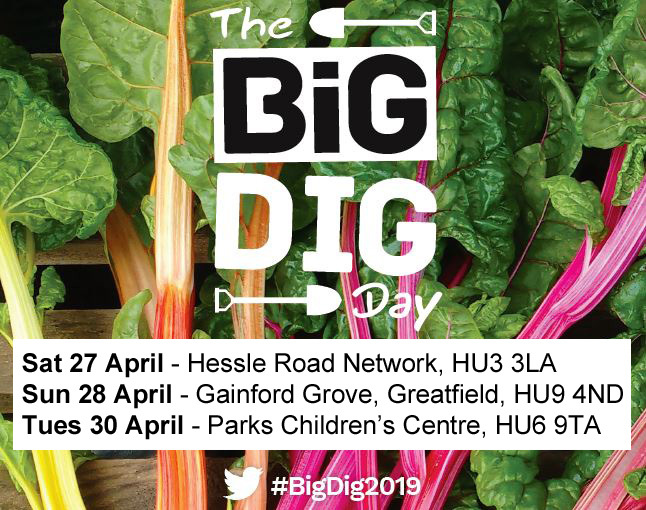 As part of our Veg Cities Campaign, the Hull Food Partnership are supporting local community growing sites such as community gardens, schools and children’s centres to get involved in the Big Dig 2019. We’ll be signing up sites and working with Absolutely Cultured to increase volunteer capacity to enable big dig events to happen all across the city. Do you want to sign up your garden to the Big Dig 2019 or to find out more? Get in touch with us using the form below or have a look at the national page for more information.